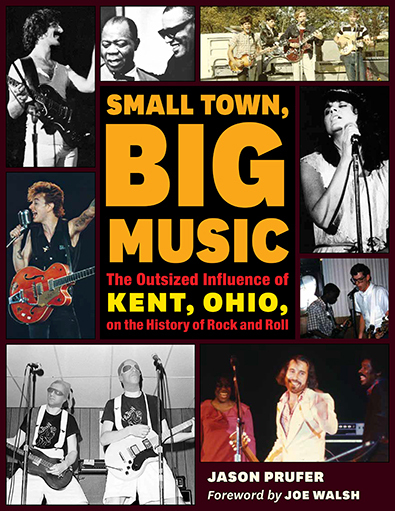 Relying on oral histories, hundreds of rare photographs, and original music reviews, this book explores the countercultural fringes of Kent, Ohio, over four decades. Firsthand reminiscences from musicians, promoters, friends, and fans recount arena shows featuring acts like Pink Floyd, The Clash, and Paul Simon as well as the grungy corners of town where Joe Walsh, Patrick Carney, Chrissie Hynde, and DEVO refined their crafts. From back stages, hotel rooms, and the saloons of Kent, readers will travel back in time to the great rockin’ nights hosted in this small town. More than just a retrospective on performances that occurred in one midwestern college town, Prufer’s book illuminates a fascinating phenomenon: both up-and-coming and major artists knew Kent was a place to play—fertile ground for creativity, spontaneity, and innovation. From the formation of Joe Walsh’s first band, The Measles, and the creation of DEVO in Kent State University’s art department to original performances of Pink Floyd’s Dark Side of the Moon and serendipitous collaborations like Emmylou Harris and Good Company in the Water Street Saloon, the influence of Kent’s music scene has been powerful. Previously overshadowed by our attention to Cleveland as a true music epicenter, Prufer’s book is an excellent and corrective addition. 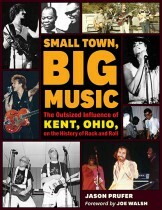 Extensively researched for eight years and lavishly illustrated, Small Town, Big Music is the most comprehensive telling of any of these stories in one place. Rock historians and fans alike will want to own this book. AuthorJason Prufer received his bachelor’s degree in art history from Kent State University and has been employed by the Kent State University Library for nearly 20 years. He has written for the Cleveland Free Times, Kent Patch, and numerous historical rock and roll blogs. Since 2011 Prufer has also worked as publicist and social media manager for the Numbers Band, an experimental rock band formed in Kent in 1969.